Coffee and tea lovers understand the problem with too much heat when making their favorite brew. High temperatures burn the tea or coffee and completely destroy the taste. Nevertheless, even with a clear understanding of the problem, we’ve been powerless to rectify it. That is, until now. The Willow&Everett Electric Gooseneck Kettle with Temperature Presets offers the best solution to this inconvenient problem. The elegant gooseneck design that improves the pour and a maximum capacity of 1L make this kettle a unique piece for any kitchen. The kettle features 5 varying temperature presets for different brews including, 180F for Green and White tea, 195 F for Oolong tea and Airpress Coffee, 200 F for Black Tea and French Press, 205 F for Herbal Tea Pour Over and 212 F for the straight boil. An auto shut off feature powers the kettle down after the contents are boiled and the Keep Warm function, will maintain the temperature of your brew so it doesn’t lose heat. It has a stainless steel exterior with a mirror finish, which boosts the aesthetic appeal and allows it to blend well with other stainless steel kitchenware. The base produces an output of 120 V and 1000 W, which speeds up the process for greater convenience. It also includes an ergonomic plastic handle and air-tight spill free lid. The company offers a money-back guarantee within 90 days if you are displeased with the product. The temperature presets are an excellent feature and allow for better brewing of either tea or coffee. The keep warm feature is also a welcome reprieve allowing you to take your time and enjoy your brew without the urgency of drinking it while hot or the inconvenience of having to re-heat it. Coupled with the auto shut off function, you can use the kettle unsupervised. 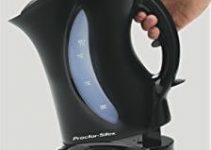 The cordless design is great for modern-day convenience, allowing you to move the kettle without worrying about cables. The gooseneck design is not only elegant but also improves the functionality of the kettle when it comes to pouring your favorite brew. The flow is smooth, gentle, precise and reduces the chances of a spill. The kettle is just the right size and it doesn’t take up too much space on the kitchen counter. Customer support is highly responsive, very helpful and available 24/7. The temperature preset buttons are touch sensitive. The lid should be air-tight but the kettle tends to spill, especially when you tilt it too much while pouring. The kettle isn’t double walled, which means that only the plastic handle can be held. The capacity is too little and the water tends to splash while boiling when you fill it to the Max. Overall, the Electric Gooseneck Kettle is a high-quality product with excellent design and high value performance. Besides being easy to use, it also offers plenty of conveniences especially with the high power output for faster boiling, auto shut-off button for unsupervised boiling and the keep warm function to warm your favorite brew after you’ve prepared it. The 90-day money back guarantee is proof of the company’s confidence in the product, but it also offers a safety net for you to try out the kettle and gauge its quality. The kettle has its downsides but those are nothing more than just inconveniences that don’t affect its performance. Do you like this kettle? Please take a sec to like and share this post. Also, leave a comment below if you want to say something.